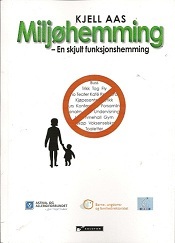 I have received a number of e-mails with questions about my book: Miljøhemming, en skjult funksjonshemming. This book was written as part of a project sponsored by The Norwegian Directorate for childrens-, youngsters'- and family matters. The project comprises the book and associated leaflets. It has been realized in a cooperation by The Norwegian Asthma and Allergy Association(NAAF)and The Norwegian Forum for Better Indoor Environment for Children (NFBIB) under professional guidance by The Norwegian Directorate for Health. There are no plans to have the book translated from Norwegian, so I have been asked to submit an overview in English. "Whenever possible , I have referred to scientific evidence. We have , however, many unanswered questions and unsolved enigmas in medicine. Research has not proceeded past year 2011! Medical resarch is a demanding challenge. You have to satisfy very strict scientific principles. Research papers about allergy and papers about hyperreactvity and asthma usually satisfy such principles, but a large number of papers about investigations and trials in chemical intolerance/MCS do not. In particular, psychiatric research in this field is disappointing. Very few of the papers about causative factors are scientifically acceptable. and conclusions and statements from such publications are not valid. In matters lacking scientific evidence I prefer to listen to the patient applying relevant scientific data to throw light on what is told. I cannot count the times I have been asked about matters lacking scientific evidence. Nobody can be 100 percent certain about this, but if you would like to know my opinion having explored the matter to the best of my scientific ability, I consider this to be so and so -----. This applies also to this book!" Most of my personal clinical and basic research has been concerned with immunology and biochemistry of allergy and hyperreactivity interacting with different aspectsof of environment. When sufferers of these disorders are disabled, their sensitivities are easily demonstrated by means of objective tests. Such tests are not available for those suffering from multiple chemical sensitivity.This fact leaves the disorder open for many theories as to cause and mechanisms. After having studied hundreds of papers on multiple chemical sensitivity (MCS) I have reached the conclusion that this disorder is due to a biochemical dysfunction. There is cumulating evidence to support this conclusion in addition to what we know about environmental chemistry combined with data from modern biochemical research in general. In biochemistry most investigators stick to strict scientific principles and present objective data which may be adapted in logical hinking. However, body and soul are so tightly intervowen that it would have been abnormal if this special dysfunction did not affect social life and emotions. The kind of bodily experiences also most likely will prepare for conditioned reflexes which may make bad worse. Regrettably, cause and effect have been mixed up in a lot of retrospective studies of MCS in which the authors conclude that MCS is a disease of the mind. Quite many studies have even semantic weaknesses. In my book I point to the confusion created when psychiatrists consider the normal and rational uncertainty or fear about what may occur around the next corner, to be a symptom of panic anxiety disorders. Furthermore, psychological features which most of us would expect to occur as normal consequenses of the social and emotional burdens of the disorder, are (mis)interpreted as symptoms of somatoform personality. Emphasis is too often put on the psyhiatric aspect of the word "psychosomatic". This word indicates, however, only that psychological factors may act together with somatic ones. This applies, for example, to the multifactorial disease asthma which is initiated by immunological and/or biochemical factors . Often the somatic features occur first, and we could call it "somatopsychosomatic". I have put words to this in the book. Looking at the stories of those suffering from MCS, it appears to me that there are several subgroups of the disorder. The major part apparently suffer from some biochemical dysfunction. In some sufferers conditioned reflexes may play a more or less dominant part with time. There is obviously also a subgroup in which emotions play a major role. Of course, somatoform persons are not spared from getting influenza, allergies, asthma, cancer or MCS so they may also be found among members of MCS organizations. To distinguish between them we need objective diagnostic tools. Time will show! Many Scandinavian readers and scientists in allergy and clinical immunology may know my background for writing this book. Most others do not, so it is easy to understand that I have been asked to tell a little about myself. I am a medical doctor with a MD degree from combinations of clinical and basic research, specialized in pediatrics and allergy. I was called by the University of Oslo to become the first professor in this field in Norway (now retired). I have tried out different workplaces in medicine,including one year in psychiatry,but I have spent most of my professional time in the University hospital Rikshospitalet, Oslo, and as head of Voksentoppen Institute for children with allergy, other intolerances and/or asthma, as well as in the research institiutes connected to the university hospital. I am the main author of more than 350 papers published in reputed scientific journals. I am honorary member of a number of international scientific organizations and have acted as visiting professor in many countries. In Voksentoppen I served an open advisory telephone line at a fixed hour of the day every workday for about 30 years. Through this I was contacted by a large number of Scandinavians of all ages seeking answers and advise about different kinds of intolerances. This included quite many with MCS-like symptoms, which meant that I had to study this matter as well as many other related disorders, and have continued to do so.